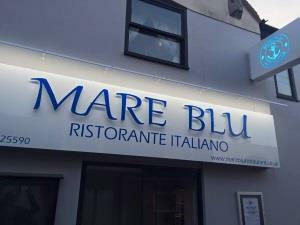 Mare Blu01277 525590work Restaurant - ItalianMare Blu is a seafood and grill restaurant, located just off the busy and famous high street of Brentwood, Essex. It is a family run business providing the freshest seafood and meat around. At Mare Blu our goal is to serve you fantastic food with a romantic and fun atmosphere. Our menu is loaded with classic Italian dishes, fresh seafood, an extensive wine list and delectable desserts sure to tickle your taste buds. Mare Blu is a seafood and grill restaurant, located just off the busy and famous high street of Brentwood, Essex. It is a family run business providing the freshest seafood and meat around. At Mare Blu our goal is to serve you fantastic food with a romantic and fun atmosphere. Our menu is loaded with classic Italian dishes, fresh seafood, an extensive wine list and delectable desserts sure to tickle your taste buds. For any private hire event we can cater any hours to suit your needs 7 days a week.